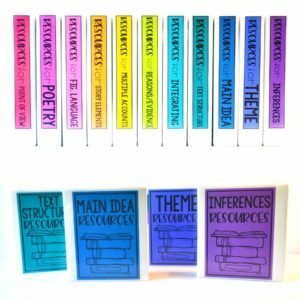 A few years ago, I wrote a blog post about how I used a variation of Daily Three in my reading classroom. 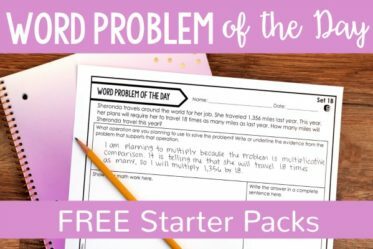 Since writing that post, I have gotten several questions about a word study activity I mentioned in the post. 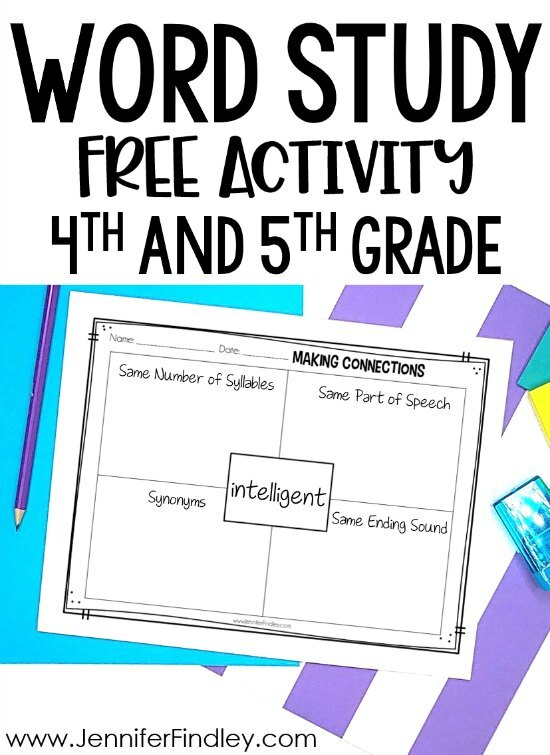 As an upper grades teacher, I have always struggled with finding word study activities that are appropriate for my students. To be honest, I still struggle and my personal goal for this school year is to work on developing or finding more word study activities that are engaging, grade level appropriate, and truly help my students think about, analyze, and explore words. 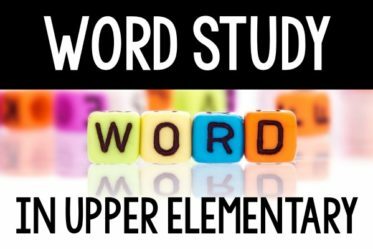 This post shares one of my favorite go-to word study activities for upper elementary students that I have used for the past five years. 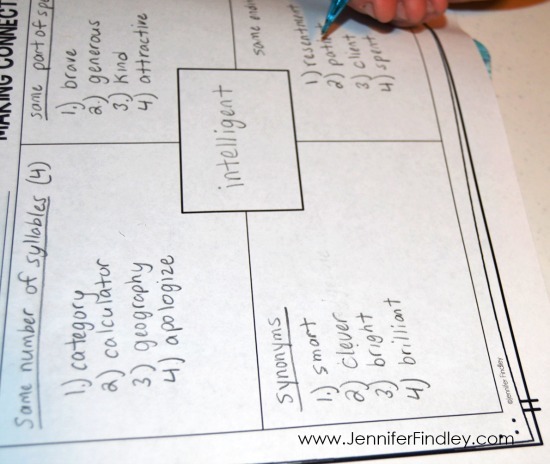 This word study activity can be completed during centers or even as a whole group activity. 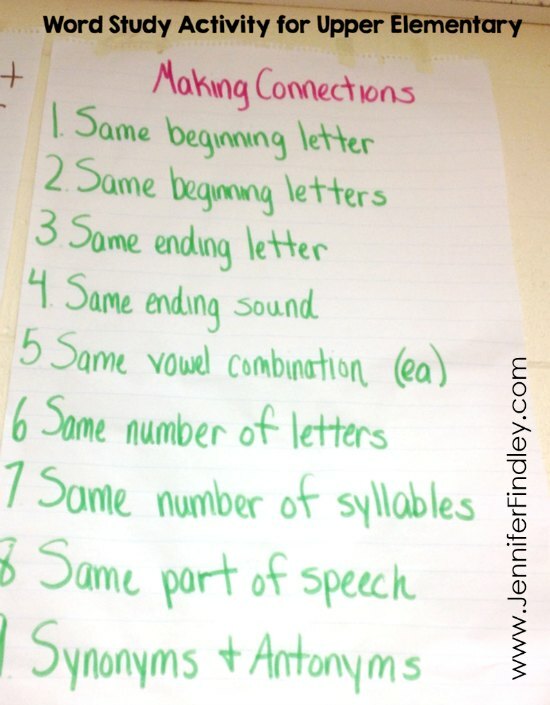 Basically, students choose one of their spelling words for the week and then “Make Connections” between that word and other known words or words they specifically search for while they are reading. 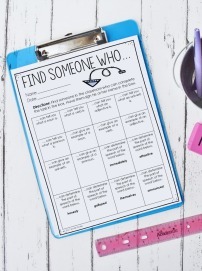 Here are the “Making Connections” choices that students can choose from at the beginning of the year to complete this word study activity. We do add to this list as the year goes on and the students become more proficient with these choices and are ready for more. I spend the first few weeks of school modeling each one of the choices. It helps ensure the students understand the choice and understand how to find words that meet that requirement. To do model this, we choose one word from our spelling list. The students help me choose “Making Connections” choices from the list that we have not used before. We go through the entire activity with students volunteering words that fit the choices we chose. 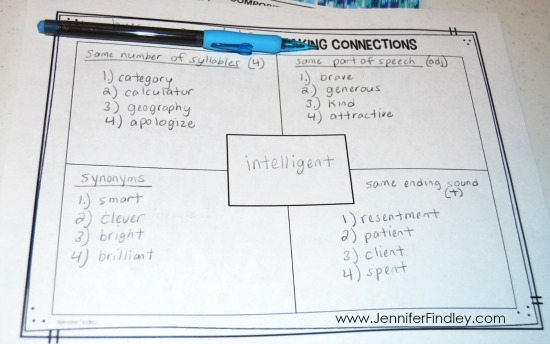 When we have four words for each, I have them choose another word from the list to complete the activity on their own with the same “Making Connections” choices. This can be done on a piece of paper easily, but I like to use a printable. It helps keep the work neat and organized, and I really dislike grading things work like this on notebook paper for some reason. The students write their chosen word in the middle of the printable. 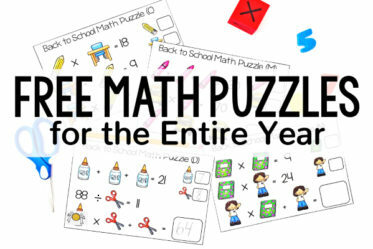 Then they write their four chosen “Making Connections” choices in the four outer boxes. As you can see, this student chose same number of syllables, synonyms, same part of speech, and same ending sound. After making their choices and clearly labeling each box with their choice, students get to work finding words that they can connect with their chosen spelling words. They can pull from their own knowledge, previous spelling lists, books they are reading, and even dictionaries. I do require that they double check the spelling in a dictionary before recording the word in their printable. This takes extra time at first, but it takes care of my dictionary skills for the year and the students get faster as they use it more. I also have a requirement of at least four words in each of the outer boxes. However, I have been known to allow students to do five in one box and three as long as they average about four words in each box. In addition to using this in a word work center or station, this can also be done whole group. 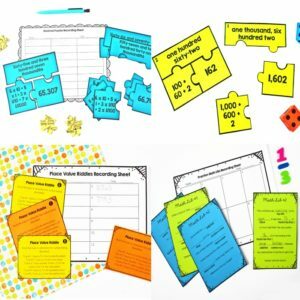 Read more about implementing word study in a whole class format versus centers by clicking here. 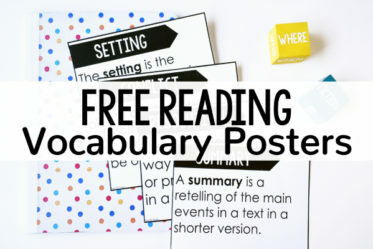 Click here or on the image below to download the FREE word study activity printable. 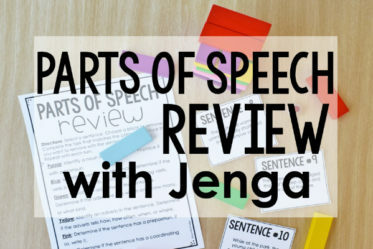 Do you have any word study activities that you have your students complete that you love? Let me know in the comments. 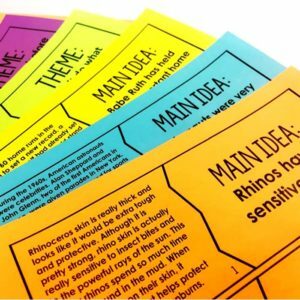 Want more word work activities? 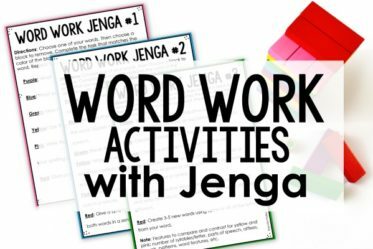 Click here to check out my FREE Word Work Activities using Jenga blocks! 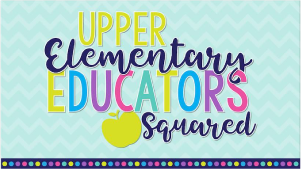 Great activity! I usually don’t do a 4 square w my spelling only w vocab—my vocab 4 square is usually definition, sentence, synonym/antonym and sketch. I absolutely love this idea!!! 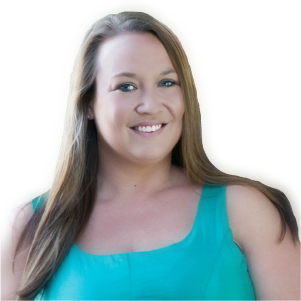 Thank you for sharing & posting this blog!!! I love this activity! One of my favorites is context clues-for my students all of the words are found in their reader-before they can define in the glossary o require them to write the word in context and guess its meaning —-I teach a few lessons to model how to find the meaning of words from context but it is a great skill to develop. I love this activity. I have used the frayer model to do word study which is also interesting. Do try.